I think I can now officially consider myself an Italian traveler (as in one who travels Italy, not one who is Italian and travels). This weekend I went on a trip with school to Pisa, Florence and Trequanda (a town in the Tuscany region). I'm only going to post about Pisa and Florence now because I just loved Tuscany so much and have too much to say about it/too many pictures to post. I couldn't get the perfect picture of me holding up the tower (which really was just so tilted, our tour guide said it's going to fall in the next 200 years!) so I did that instead. Pisa is really quaint; there's not much else to see besides the tower and its accompanying cathedral and baptistry. We climbed the 294 steps to the top of the tower and got to look out on all of the town and the surrounding mountains. There isn't anything else to say really; it was beautiful, we ate decent pizza, and got back on the bus to head to our hotel in Montecatini Terme (a little village in between Pisa and Florence). 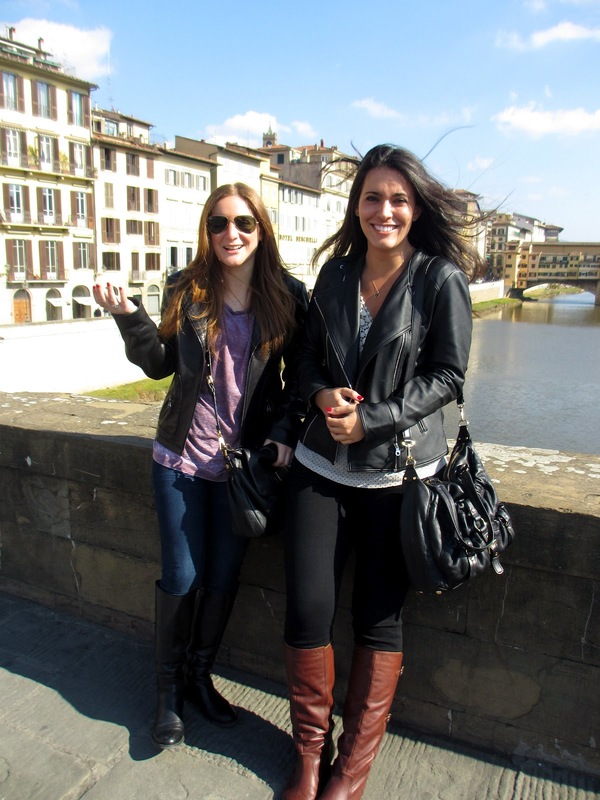 Saturday we arrived in Florence at around 10 and had a walking tour first. We saw the Duomo and its cathedral and bell tower, a copy of the David, the Ponte Vecchio, and lots of leather (obviously the most important part). After the tour, we were torn between our growling stomachs and our desire to purchase all the leather in the entire city. Our stomach's won, as per usual. We went to this restaurant our guide recommended, Trattoria Ponte Vecchio along the river. I was brave and had pappardelle with boar! It tasted a lot like regular bolognese, just a bit smoother, if that makes sense. After lunch we took an obscene amount of pictures on one of the bridges and then headed over to the leather market. It's very similar to any other open air market, except most of the stuff is real. Naturally I couldn't decide what I wanted, since I don't wear belts or gloves, and even though I'd love a brown leather jacket it wasn't necessary, and I already have a great wallet. So, even though I definitely don't need it, I got another bag. It's grey leather and really structured and perfect for an internship or just when I feel like looking like a grown up. Then, after shmying around for hours, it was gelato time (as it is every day at around 4 o'clock). 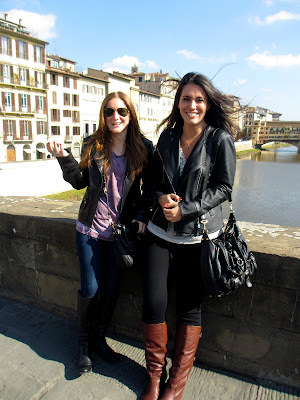 Rachel (who's studying in Florence) took us to this place along the river, Santa Trinita Gelateria. It's all artiginale, which means that it's homemade.